In approximately 5 minutes I will be interviewed live on the Fox 25 evening news to discuss the legislature's upcoming 2014 agenda. I was an in-studio guest on the Fox 25 News last night to discuss the troubling case of 5-year-old Jeremiah Oliver of Fitchburg, whose family has been receiving services through the Department of Children and Families since 2011 and who has gone missing since September. Please click on the video below to view the segment in its entirety. “Today’s press conference by DCF Commissioner Olga Roche exposed more troubling details about the failure of the department to protect 5-year-old Jeremiah Oliver. While the commissioner is right to discharge those at fault from state employment, and to order better scrutiny of certain cases, the situation deserves more. I will be appearing live on Fox 25 this afternoon to discuss the disappearance of 5-year-old Fitchburg resident Jeremiah Oliver, whose family has been receiving services through the Department of Children and Families (DCF) since 2011 but who has been missing since September 14th. During the segment, I will be providing my reaction to today’s press conference by DCF Commissioner Olga Roche and Health and Human Services Assistant Secretary of Children, Youth and Families Kathy Betts announcing “action steps” the agency is taking to “help strengthen families and ensure a safe and secure environment for children.” Earlier this month, I joined with my colleagues in the Senate Republican Caucus in calling for an independent investigation by Auditor Suzanne Bump and/or Inspector General Glenn Cunha into DCF’s failures regarding Oliver’s disappearance. The segment will air live on Fox 25 today at approximately 4:57 p.m.
On Friday I was interviewed by NECN Reporter Peter Howe regarding a bill I filed that would authorize Massachusetts' Division of Marine Fisheries to establish a Massachusetts Seafood Marketing Program. To view Friday night's segment please play the posted video below. Christmas is the one time of year where everyone has the opportunity to feel like a child again. It is a special day where strangers become friends, and where loved ones are honored and cherished. It is my hope that among all the blessings of this day, that we each take a few moments to honor our servicemen and servicewomen who are currently home and overseas protecting this great nation. Boston- Responding to recent reports of the disappearance of a missing 5-year-old Fitchburg child, the Senate Republican Caucus, led by Senator Don Humason (R-Westfield), who is the republican member serving on the Joint Committee on Children, Families and Persons with Disabilities, is calling for an independent investigation by Auditor Suzanne Bump and/or Inspector General Glenn Cunha into the failures of the Department of Children and Families (DCF) regarding the disappearance of Jeremiah Oliver. Since September 2011, Jeremiah Oliver and his family have been receiving services from DCF, however, the supervisor and social worker assigned to the family failed to conduct monthly, mandated household checks. Sadly, Jeremiah Oliver was last seen on September 14th, and his whereabouts remain unknown. · providing procedural recommendations, that when adhered to, will require that DCF acts in a manner that is accountable and open to oversight. “The nature and scope of these developing circumstances demand independent investigations. Only through well-developed inquiry can we determine how to best help the staff and management of DCF to protect the lives of children,” the Caucus wrote. Today I had the honor of attending the Massachusetts Executive Office of Public Safety and Security’s 24th Annual “Firefighter of the Year” Award Ceremony. Governor Deval Patrick, Secretary of Public Safety and Security Andrea Cabral, State Fire Marshal Stephen Coan, and I were all on hand to support and honor firefighters across the Commonwealth for their acts of heroism and bravery. Among today’s recipients were members of the Gloucester Fire Department: Captain Joseph Aiello, and Firefighters Jonathon Sanger, Charles Scola, James Burke, Robert Rivas, Frank LeClerc, James Hannon, and Paul Hudson, who were recognized for their bravery in trying to rescue a 15-year-old girl in April during a house fire on Summer Street in Gloucester, and three other fires throughout the city earlier this year. I am deeply appreciative of the efforts of the members of the Gloucester Fire Department and all of those in the fire service throughout our state for their personal commitment and sacrifice on behalf of our safety and well-being. 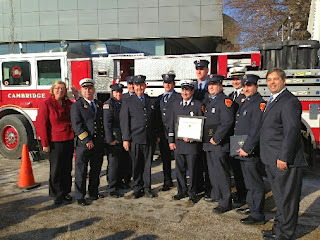 Posted below are two photos of Gloucester’s firefighters at today’s ceremony; one with Governor Deval Patrick during today’s ceremony, and one with Mayor Carolyn Kirk and myself. This evening at approximately 6:30pm I will once again be a guest on the Fox 25 News. I will be discussing the disappearance of a 5-year-old Fitchburg child, and the recent firing of two employees of the Department of Children and Families, who were assigned to monitor his family upon allegations of abuse, but failed to do so. Please tune in to see tonight’s discussion. Tonight at 7:00pm WGBH’s Greater Boston with host Emily Rooney will be broadcasting a special report on sand erosion. Last week I was able to sit down with reporter Rupa Shenoy about a sand erosion special commission I sponsored, that is now law, and what actions Massachusetts needs to take to support coastal communities. Please tune in to Channel 2 at 7:00pm and again at 12:00am tonight to watch Rupa’s special report. 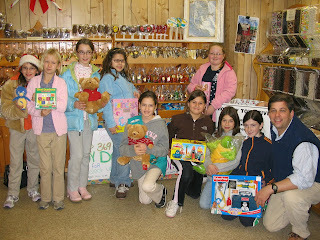 Tomorrow starting at 6:00am I will join with North Shore 104.9 in our annual North Shore Toy Drive. We will be broadcasting live from 10 different locations throughout the day in an effort to collect as many toys as possible for area charities to go to local children. 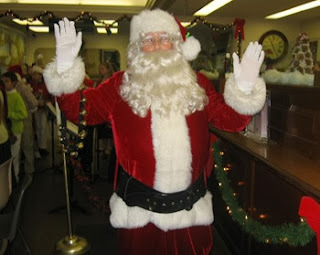 This exciting event brings together community officials, local talent, school systems, and even Santa and Mrs. Claus all in the spirit of giving. All the broadcasts are open to the public, and we would love to see as many new faces as possible this year. The final broadcast, which is the Cape Ann Savings Bank on Main St. in Gloucester, will even feature special guests for children! Come for the food, for the entertainment, or to take pictures with Santa Claus, but most importantly please come to drop off a toy or gift card. Through all of our hard work, we can truly make a child’s Christmas a special one. To view all of the live broadcast locations, please click the schedule above. To read a recent press release that I distributed earlier this month, please click here. For the past several years I have worked in partnership with local radio station North Shore 104.9 FM to conduct a month long toy drive to benefit children of the North Shore, and on Thursday, December 12th we will be broadcasting live from 6:00am-6:00pm throughout the North Shore for one final push to collect toys before the holidays. This year we hope to collect more toys than we have in the past due to the increase in need. Posted below is the press release that I released today. It contains a complete schedule and toy drop-off locations. I hope to see you on the 12th! Beverly- With the need for toys at an all-time high for local children, Senate Minority Leader Bruce Tarr (R-Gloucester) and North Shore 104.9 will once again broadcast live all day from several locations on the North Shore to collect as many toys, gift cards, and monetary donations as possible to fulfill that need. This year’s Holiday Toy Drive will take place on Thursday, December 12th from 6:00am to 6:00pm from ten locations on the North Shore. The live broadcast will feature local entertainment, school choirs and bands, great food, and interviews with local officials. Even Santa Claus and Mrs. Claus will be lending a helping hand to support the cause! 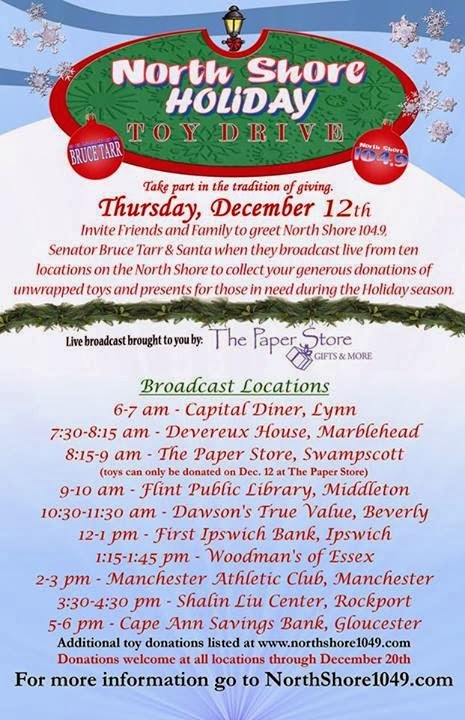 The Paper Store has also partnered once again with Senator Tarr and North Shore 104.9 to present the 18th annual North Shore Holiday Toy Drive broadcast. Family & Children's Service of Greater Lynn, Inc.
Toys can be dropped off at any of these locations now through Friday, December 20th. For further information, please call JoAnn Gillette at North Shore 104.9 at 978-927-1049 extension 19 or Senator Bruce Tarr at 617-722-1600. Tonight at 9:00pm I will be joining “Nightside” host Dan Rea to discuss the tragic case of Puppy Doe, and the PAWS Act, the comprehensive legislation I have filed to address animal abuse. If you have any questions or comments please call in during tonight’s segment by dialing (617) 254-1030. To learn more about Puppy Doe and the PAWS Act, please click here to read a previous post regarding the issue.